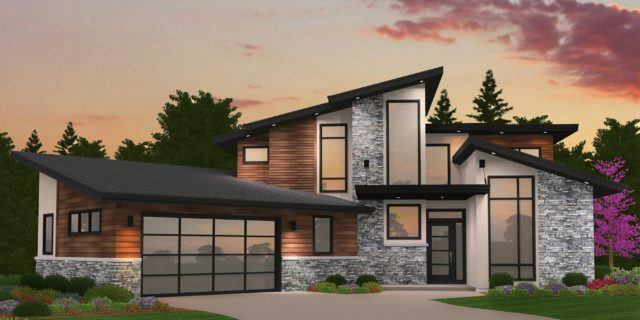 Mark Stewart Modern Home Design includes crisp, sharp geometry and almost always will be accompanied by warm material use that creates a dynamic tension and contrast that is always energetic and comfortable at the same time. We have produced unique, modern house plans that share all these characteristics and are affordable to build at the same time. Modern Home Design is always a bit controversial. Is this style modern or contemporary? Many use these two style terms interchangeably, making it confusing on where to draw the line. We have concluded that , “modern” is a style of its own, while “contemporary” can encompass many different styles that are current or en vogue. We view modern design as timeless and iconic, like the work of Eames and Saarinen.